“Good morning” to the sky. The bays are fresh and cool. That makes one feel a child. A church spire and dark trees. Have softened with the day. A ship-mast and a pine. Are gliding to and fro. 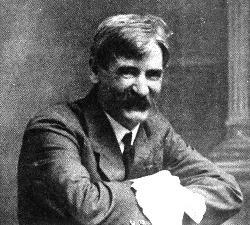 Henry Lawson (1867 - 1922) was born in New South Wales but moved to Sydney as a teenager. Deaf from the age of fourteen due to damage from an ear infection, he was an avid reader who began publishing poetry at the age of twenty. Henry wrote nonfiction and short stories as well as poetry, using Australia’s bush country and rural residents as a theme for much of his work; this focus earned him a reputation akin to some of America's "cowboy poets." One of Australia’s most celebrated writers during his lifetime, Henry’s chronic financial problems and alcohol abuse kept his personal life in turmoil, but he was much beloved by his countrymen, and his death was marked with a state funeral attended by thousands of mourners. From childhood memories and back again to present reality reflection. Lovely! The title... Lavender Bay delivers a good poem/visual.Thanks,Jayne. Another very enjoyable poem. Thank you Jayne, I'll have to look for more ofhenry Lawson's work.